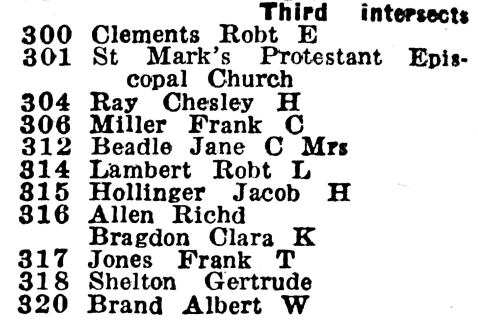 Washington Evening Star, 12 April 1930, p. 7. 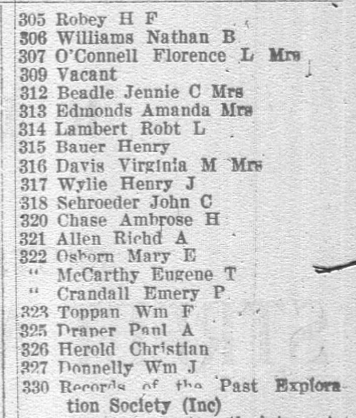 Washington Evening Star, 9 January 1903, p. 5. Benjamin O. Greenwell (carpenter); Joseph B. Greenwell (grocer). 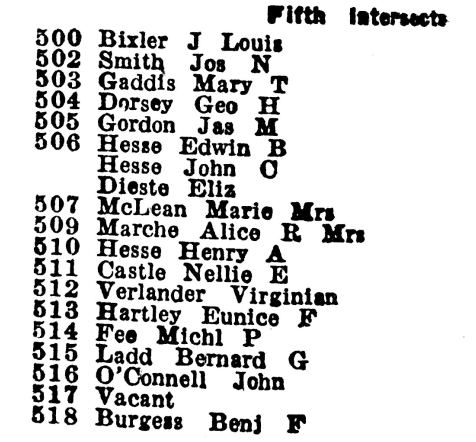 Morgan F. Mount (Mount & Co., china & glassware [business address]); Nicholas H. Main (assistant cashier, P. P. C. Co.). Morgan F. Mount (Mount & Co., china & glassware [business address]); Mary J. Mount (Mount & Co.). 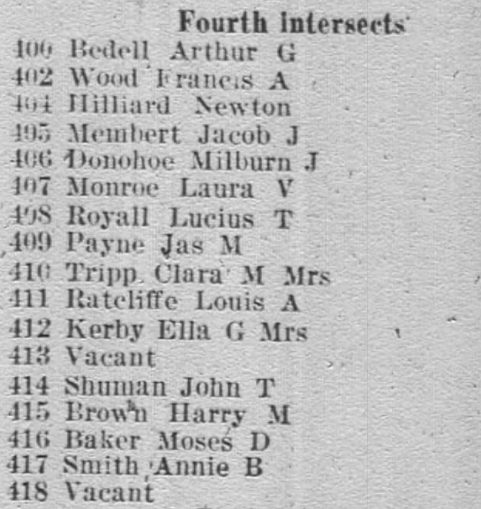 Morgan F. Mount (Mount & Co.); Mary J. Mount (Mount & Co.). 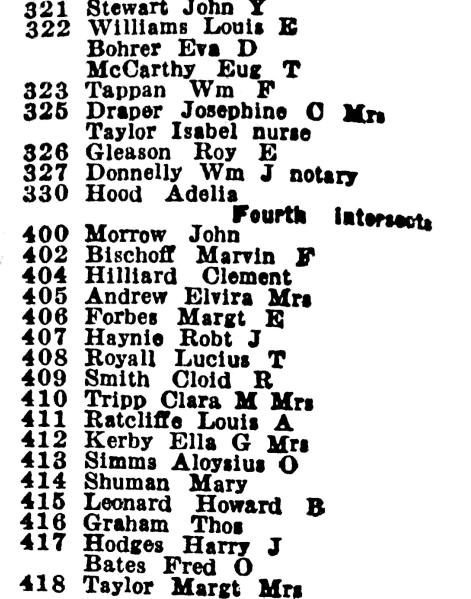 Morgan F. Mount (Mount & Co.); Mount & Co. [business address]; Matilda Contee (servant); Nicholas Main (superintendent). 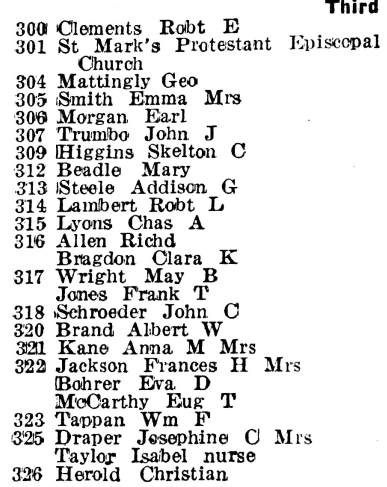 Morgan F. Mount (china, glass and earthenware [business address]). Daniel Norton (plumber); William Young (laborer); Mary C. Ratcliffe (charwoman); Louisa Coleman (washer); Charles A. Rice (laborer). 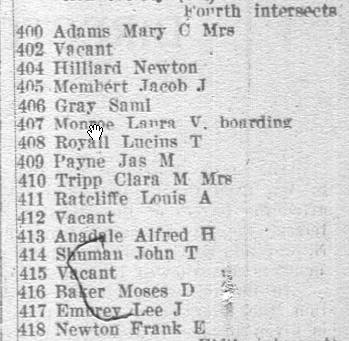 Daniel Norton (plumber); Mary C. Ratcliffe (clerk, Treasury Department). Daniel D. Marsh (brickmaker); Daniel Norton (plumber). 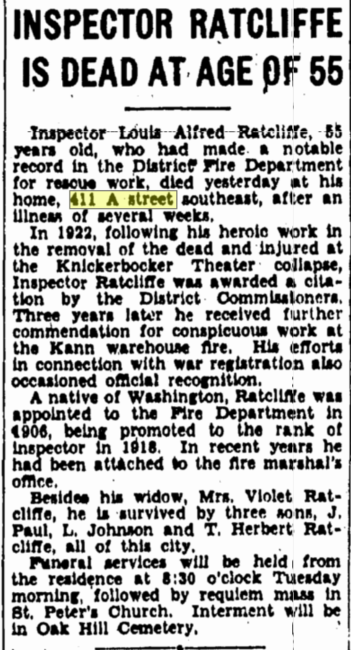 Mary C. Ratcliffe; Daniel Norton (plumber). 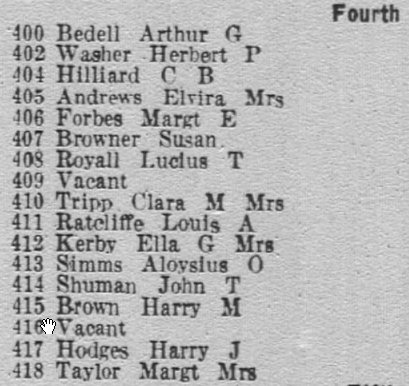 George F. Crown (oysters [business address]); Daniel Norton (plumber); Mary C. Ratcliffe (widow of William Ratcliffe); Daniel D. Marsh (watchman). 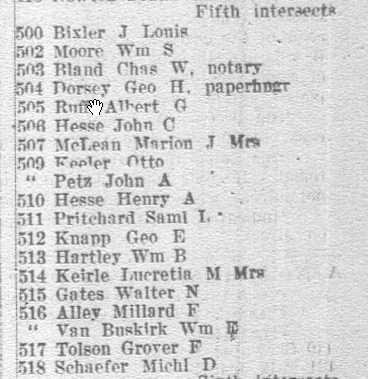 Daniel Norton (plumber); George F. Crown (oysters [business address]); Mary C. Ratcliffe (charwoman); Daniel D. Marsh (watchman); Judson T. Faulkner (agent). 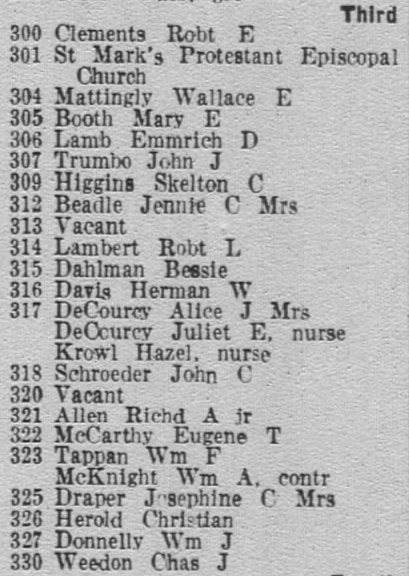 Daniel D. Marsh (watchman); George F. Crown (oysters [business address]); Daniel Norton (plumber). 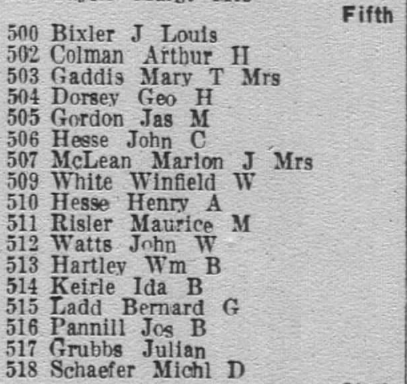 Mary C. Ratcliffe (laborer); Daniel Norton (plumber); Catharine C. Ratcliffe (bookkeeper); William Heath (laborer); George Barnes (tinner); George F. Crown (oysters). 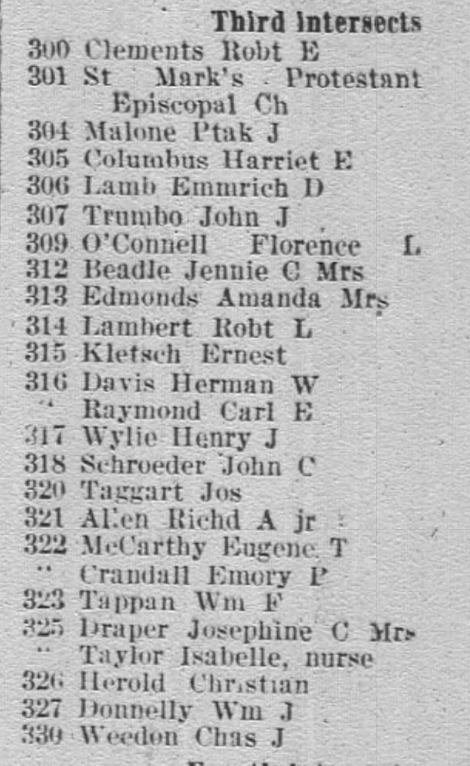 George F. Crown (oysters [business address]). 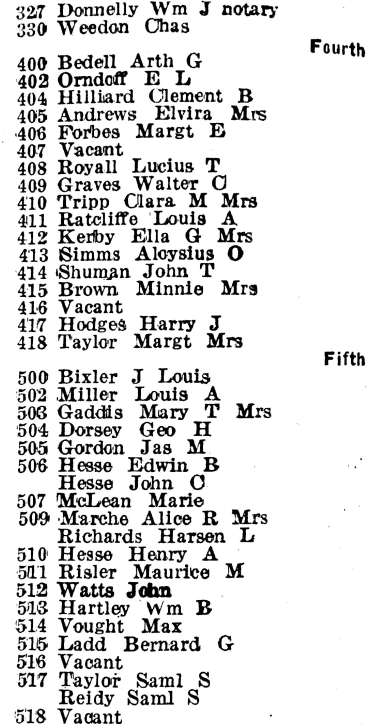 George F. Crown (oysters [business address]); John H. Smith (cook); Marie C. Smith; Charles Lewis (waiter); Martha Fox (widow); Mamie T. Lewis (widow of John Lewis). 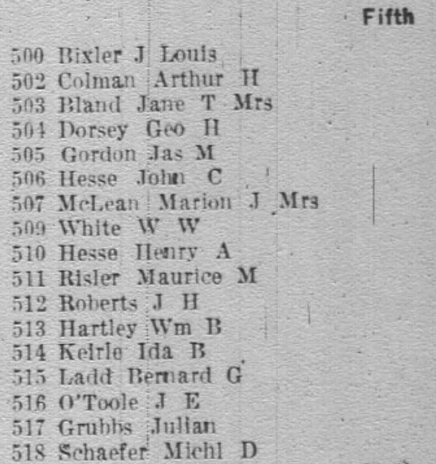 Barnes & Thomas (William H. Barnes and Thomas F. Thomas (oysters [business address]); Mary Jackson (Government Printing Office); Annie Smith (widow of Harrison Smith); Erskin Smith (driver). 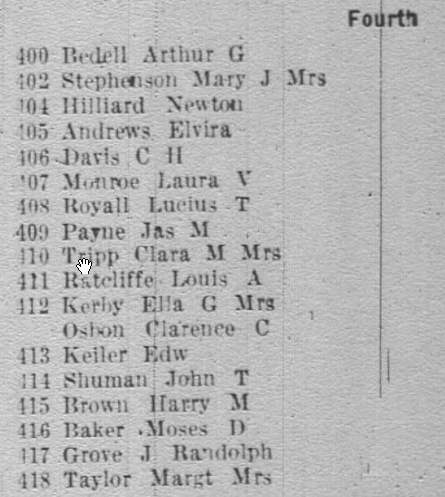 Thomas F. Thomas (oysters [business address]); Charles R. Douglass (Pension Office); Erskin Smith (laborer); J. Marwin Carpenter (waiter). Barnes & Thomas (oysters [business address]). 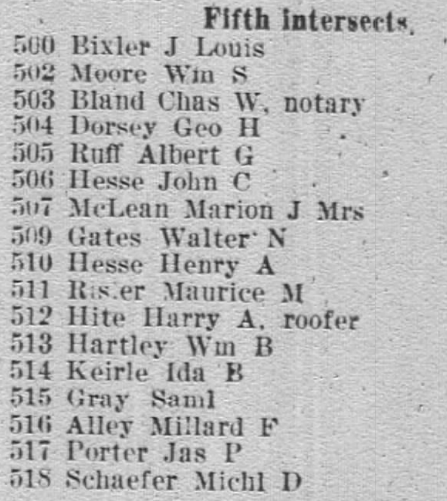 Jesse Clark (driver); Nancy Johnson (domestic); Alice Thomas (domestic); Frederick Thomas and William H. Barnes (oysters [business address]). 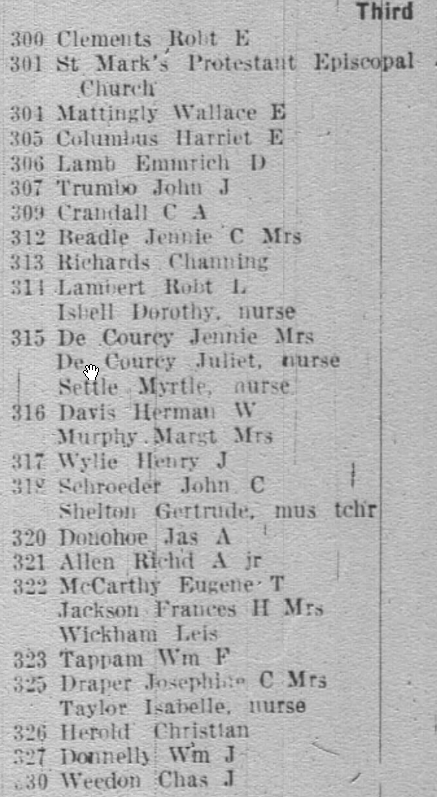 S. Gertrude Shelton (music teacher, boards). Gertrude S. Shelton (music teacher, boards). John C. Schroeder (assistant secretary, Washington Safe Deposit Co.).